Some stories grab hold of you and shake you to your very foundation. The fear of [insert tragedy here] happening to your child disrupts your psyche, your sleep, your daily routine. I have been full-out consumed by national headlines at times (Casey Anthony comes to mind). Some local stories, like the one I am about to share, have had an even greater impact because I know the people involved. In self-protective mom mode, the severity of the crash initially didn't register. Tim had hit a tree at 80 miles per hour. When Monte finally made her way through the intricate maze of suburban streets and hospital corridors, she saw her somber ex-husband next to her baby boy. He was bloody, beaten, bandaged ... and beeping. The monitors and IVs and machines mercilessly screamed in sick unison that the end of his life was near. A priest was there, reading Tim his last rites. Admittedly, Monte "flipped out" and, on mother's intuition alone, kicked the priest out of the room. Stat. "This might sound crazy, but I just knew Tim would make it," she told me. "He always had unbelievable drive and ambition. He was not going to give up." She had witnessed Tim's tenacity firsthand since the day he was born. He decided he wanted to be a major league baseball player the first time he picked up a bat at age 4... and was well on his way to making his dream a reality. As a freshman at Masconomet Regional High School in Boxford, Massachusetts, Tim was a member of the varsity baseball team that won a state championship. Named captain for his junior and senior years, Tim led his team to numerous titles. He was not only MVP of the Cape Ann League but also, as a member of the Massachusetts All-Star team, MVP of the Massachusetts vs. Connecticut game played at Fenway Park ... all despite having a seizure disorder that may have scared some kids off the field. Tim was sidelined with a traumatic brain injury but his head was still in the game, just as his mom predicted. He laid in a coma for 60 days. Steadfastly by his side, as always -- Monte once coached Tim's little league baseball team! -- she gave him the resolve to regain consciousness. When he woke up, he had to endure the grueling process of learning how to talk, walk, and care for himself all over again. Monte quit her job to be there for every step, every breakthrough, every milestone ... just as she was when he was a child. Their relationship had come full circle. Rehabilitation continues to this day, fourteen years later, but Tim has made remarkable strides that surpassed everyone's expectations (except for Monte's). And he has taught his mom a lot of lessons along the way. Tim didn't give up his dream of being a major league baseball player until he absolutely had to -- a decade after the accident. He showed me that if you want something, never give up. He continued to go to the gym every single day, despite the odds. He did get on a team and played for a few years. Even if he sat on the bench, he never quit. When baseball was out of reach, he started to write a book. That was his new dream. Tim's memoir, A Life Interrupted, was recently published. He doesn't sugarcoat the difficulty of recovery from all perspectives: physically, emotionally, spiritually. Tim had been drinking at a party on the night of the accident. He originally made the right call, to get a ride home with a sober friend. But then he had a fight with his girlfriend and made the fateful decision to drive to her house to discuss their differences face-to-face. The alcohol coupled with a missed dose of anti-seizure medication proved catastrophic. 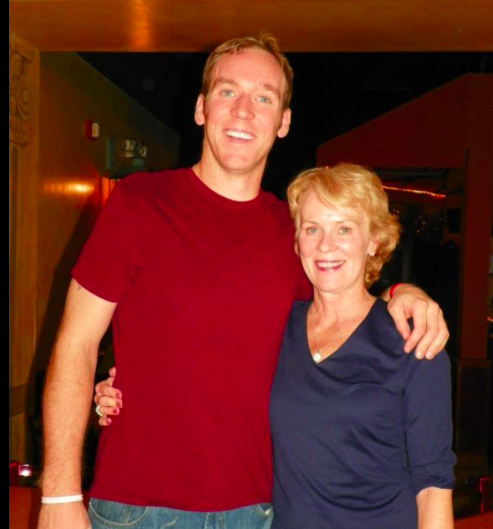 A Life Interrupted not only details Tim's triumph over tragedy but also serves as a long letter of gratitude to his mom. In it, Tim eloquently describes how it feels to be enveloped by his mom's love and how her unwavering belief in his ability to rejoin the world got him through his darkest days. Monte doesn't view the years she's spent in countless hospitals, rehab centers, and therapy sessions as a sacrifice; she views them as part of being a mom. There's nowhere she'd rather be than cheering Tim on, regardless of whether it's for baseball or biofeedback. "I don't think I ever had to find the resolve to keep going," said Bransfield. "Nothing is greater than the love a mother has for her child. I am so blessed and thankful to have this amazing kid in my life. He is my gift this Mother's Day, and every day." You can follow Jodi Meltzer on The Huffington Post, Mommy Dish, Facebook, and Twitter.